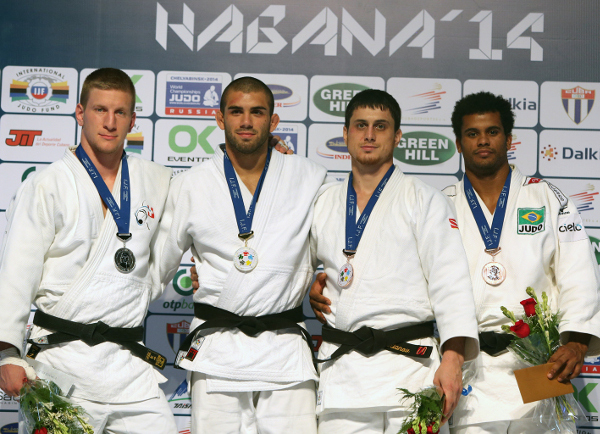 The first Havana Grand Prix came to a pulse-pounding conclusion on Sunday as the heavyweights battled toe-to-toe in the first IJF event in the Rio 2016 Olympic qualification phase. Cuba were well represented on the tatami and in the stands as the event will long be remembered for its colour and vibrancy. The three-day Grand Prix captured the imagination of the Cuban faithful who savoured every contest as they witnessed a flagship IJF event unfold at the City Sport Coliseum. 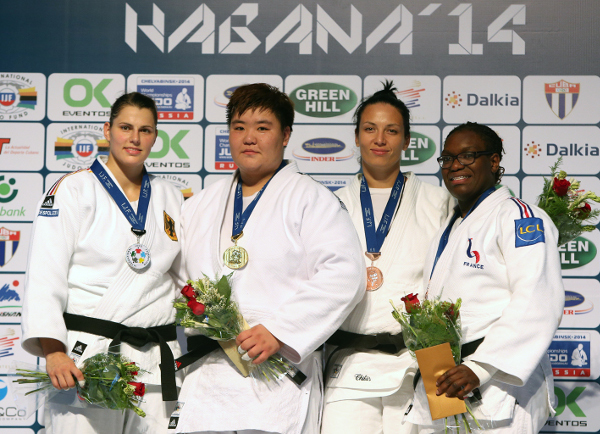 The women’s -78kg and +78kg categories took to the tatami along with the men’s -90kg, -100kg and +100kg categories. Mr. Vladimir BARTA, IJF Head Sports Director, believes Cuba was the ideal location to stage the first IJF competition on the road to Rio 2016. “To deliver a Grand Prix event here in Cuba shows the professionalism of the International Judo Federation and the high level of staff who have been involved in coordinating the event. IJF Hall of Famer Neil ADAMS shared his thoughts on the start of the qualification campaign and stressed the importance of already being in a healthy position on the World Ranking List. “Everyone forgets about first two year’s you have to build a solid base during that time. The German team stayed active following the World Championships after Rio and as a result a lot of their athletes are highly-ranked coming into second period. Mr. Javier SOTOMAYOR, the Barcelona 1992 Olympic high jump champion and double world champion, was in attendance enjoying the first IJF World Judo Tour experience in his homeland. “I’m very pleased to be here at the first Havana Grand Prix, I know all about the history of importance of judo in this country and how well the sport is led by the International Judo Federation,” said the track and field legend. 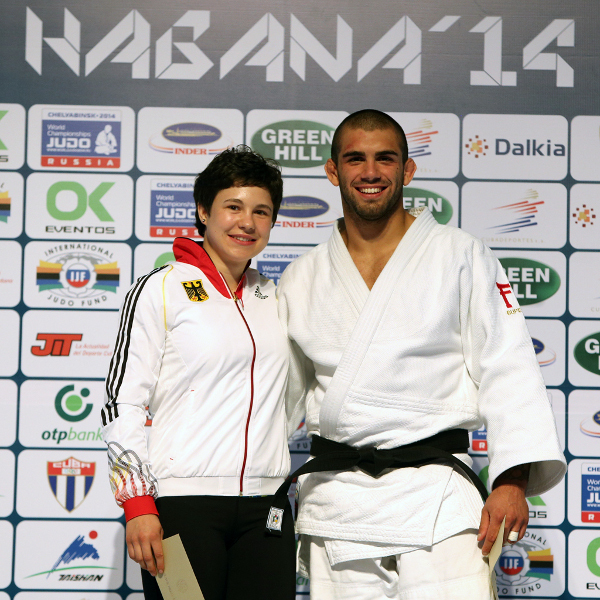 Toma NIKIFOROV (BEL) won the best male judoka award for his -100kg gold while Laura VARGAS KOCH (GER) won the women’s award for her -70kg triumph. The next stop on the road to Rio is the first Budapest Grand Prix from Saturday 21 – Sunday 22 June. 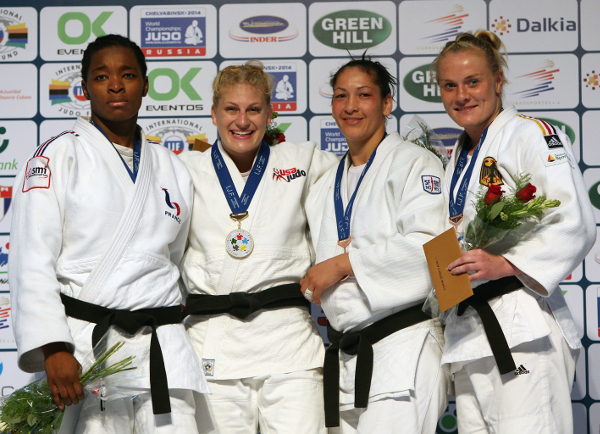 Olympic champion Kayla HARRISON (USA) returned from a year-long injury lay-off by taking the -78kg gold medal as world number one and European champion Audrey TCHEUMEO (FRA) had to settle for silver. HARRISON looked like she was never away as she eased into the final where TCHEUMEO received two shido penalties for passivity while the American was penalised once for the same offence. HARRISON has already laid down a timely marker as she works towards defending her Olympic crown in Rio. In the first semi-final TCHEUMEO was limited in offense by the stellar work of Pan American Championships silver medallist Catherine ROBERGE (CAN) but the Frenchwoman guaranteed another medal for her country by winning a battle of shido penalties. ROBERGE was penalised on four occasions to receive hansoku-make as she infringed for going out of the area twice and passivity on two occasions. In the second semi-final HARRISON breezed into the gold medal contest by throwing Baku Grand Slam bronze medallist Anastasiya DMITRIEVA (RUS) with a uki-goshi for ippon. The first bronze medal was won by Beijing Olympic silver medallist Yalennis CASTILLO (CUB) who won her country’s first medal of the day at the expense of beaten semi-finalist DMITRIEVA. The scoreless contest looked set for golden score with both judoka being penalised three times but there was time for the Russian to receive one final penalty for passivity to receive hansoku-make. The second bronze medal contest was won by Samsun Grand Prix winner Luise MALZAHN (GER) who defeated world number nine ROBERGE. MALZAHN fell behind to a waza-ari after ROBERGE countered the ouchi-gari attempt from the world number four by turning her over momentarily. MALZAHN replied by scoring ippon with an explosive pick-up. Qingdao Grand Prix runner-up MA Sisi (CHN) took heavyweight gold in Havana as she bested European bronze medallist Franziska KONITZ (GER). MA, who won the Madrid European Open a week ago, and her opponent were only separated after a tense four minutes from a yuko scored by MA who is on the rise in 2014. In the first semi-final KONITZ silenced the teeming crowd with the scalp of Olympic and world champion Idalys ORTIZ (CUB). KONITZ was a figure of composure as she forced ORTIZ to make errors and receive shido penalties for stepping out of the area and twice for passivity to lose out on penalties 3-2. In the second semi-final MA stopped the route to the final of cadet world champion Gusmary GARCIA SAVIGNE (CUB) by pinning her down in osaekomi-waza with a mune-gatame. The first bronze medal was won by Baku Grand Slam bronze medallist Ksenia CHIBISOVA (RUS) who ensured GARCIA SAVIGNE left her home event without a medal. CHIBISOVA scored a waza-ari and her Cuban rival accumulated two shido penalties for passivity as she had to settle for a respectable fifth-place. The second bronze medal was clinched by European champion Emilie ANDEOL (FRA) as ORTIZ suffered the same fate as her younger teammate GARCIA SAVIGNE. ORTIZ was penalised for passivity, a false attack and going out of the area as she lacked bite on home soil and lost out by shido penalties with only one against the French fighter. World number one and world runner-up Varlam LIPARTELIANI (GEO) emerged victorious in the -90kg final with a dominant display against double Olympic medallist Tiago CAMILO (BRA). CAMILO, who took silver in Sydney 2008 and bronze in Beijing 2008, was returning from a shoulder injury sustained at the 2013 World Judo Masters in Tyumen. LIPARTELIANI, who started the final by being penalised with a shido for an overly defensive grip, then rolled CAMILO who failed with an uchi-mata attack to score waza-ari. 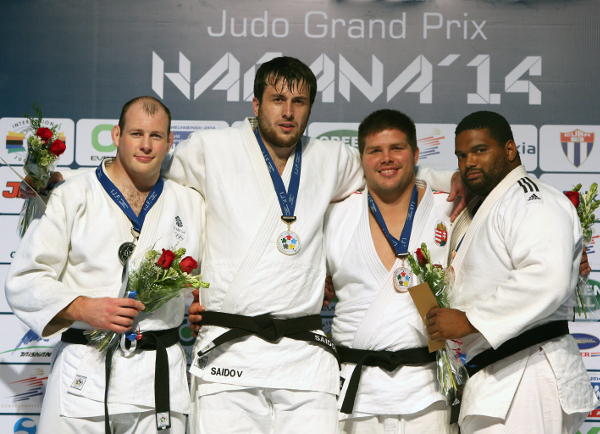 The Georgian underlined his status as the man to beat at -90kg by adding a second waza-ari with a ko-soto-gake. In the first semi-final LIPARTELIANI won an intriguing all-Georgian contest against Baku Grand Slam bronze medallist Beka GVINIASHVILI (GEO). LIPARTELIANI narrowly defeated his 18-year-old teammate with a yuko as GVINIASHVILI offered a rough assignment. In the second semi-final CAMILO defeated European bronze medallist Christophe LAMBERT by ippon after two minutes of action. 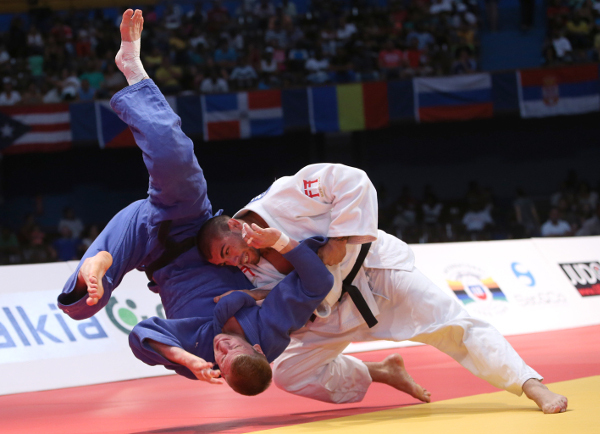 The first bronze medal was won by European silver medallist Kirill VOPROSOV (RUS) who threw LAMBERT with a drop seoi-nage after 80 seconds for ippon. The second bronze medal was captured by Junior world champion GVINIASHVILI who countered a ura-nage attempt from Rijeka Grand Prix bronze medallist Ciril GROSSKLAUS (SUI) to catch him with a ko-uchi-gari for ippon with 14 seconds left. Cuba’s Olympic silver medallist Asley GONZALEZ (CUB) was denied the chance to compete in the Grand Prix before his fans and compatriots as he was ruled out by a shoulder injury. Junior World Championships bronze medallist Toma NIKIFOROV (BEL) was one of the big winners in Cuba as he topped an IJF podium for the first time with victory against Rijeka Grand Prix bronze medallist Flavio ORLIK (SUI). In a fascinating contest featuring two men who have big ambitions in this Olympic cycle, NIKIFOROV, 21, who won three of his four contests by ippon on the final day, settled the final by throwing his 23-year-old Swiss opponent with a drop seoi-nage after 80 seconds. In the first semi-final NIKIFOROV, who shocked world number one and European champion Lukas KRPALEK (CZE) in the quarter-final, powered past two-time Pan American champion Hugo PESSANHA (BRA). The Belgian youngster lifted the Brazilian with ease not once but twice as he threw twice with a trademark ura-nage to produce two waza-ari scores. In the second semi-final ORLIK (SUI) saw off European bronze medallist Adlan BISULTANOV (RUS). The Swiss judoka attacked with uchi-mata which had the Russian on the backfoot and ORLIK took full advantage by driving him over with an osoto-gari effort. 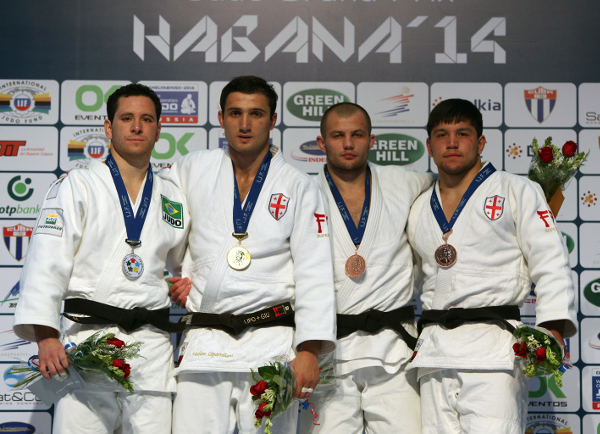 The first bronze medal was won by BISULTANOV who returned to winning ways against world number 97 Gergo FOGASY (HUN). BISULTANOV went ahead with a waza-ari from a ko-soto-gake and secured a place on the podium by grinding down the 20-year-old FOGASY in osaekomi as the Russian applied a tate-shiho-gatame for 15 seconds to add a second waza-ari. The second medal was won by PESSANHA who conquered Jeju Grand Prix bronze medallist Martin PACEK (SWE) by submitting him with a ude-garami after leading with a waza-ari from a ko-uchi-gari in an absorbing contest. 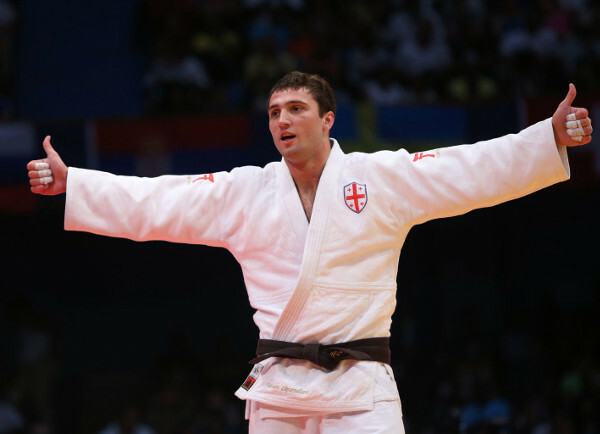 Baku Grand Slam bronze medallist Renat SAIDOV (RUS) outgunned surprise package Chris SHERRINGTON (GBR) in the last contest of the first Havana Grand Prix. Former Samsun Grand Prix bronze medallist SHERRINGTON, who will represent Scotland at the Glasgow 2014 Commonwealth Games in July, defeated European silver medallist and top seed Adam OKRUASHVILI (GEO) in his opening bout to make a statement of his intent in Havana. Man-mountain SAIDOV looked strong as he floored the British judoka with ashi-waza and Russia’s immovable object added a yuko which went unanswered by SHERRINGTON. In the first semi-final Royal Marine SHERRINGTON erased the gold medal hopes of Samsun Grand Prix bronze medallist Levani MATIASHVILI (GEO) who elected to tap out to a forceful kami-shiho-gatame with six seconds remaining. At the same stage of the competition SAIDOV had the measure of former European bronze medallist Barna BOR (HUN) as he bested the Hungarian by ippon after just 23 seconds. The first bronze medal went to BOR as top seed Adam OKRUASHVILI (GEO) was unable to fight after breaking a rib in the preliminaries. The second bronze medal was won by Beijing 2008 Olympic bronze medallist Oscar BRAYSON (CUB) in 24 seconds by ippon as MATIASHVILI rushed in and was caught with ashi-waza to delight the home crowd.